If there's a moment that captures the spirit of Lucas Torreira, it happened during the 2018 FIFA World Cup finals in Russia. After progressing to the knockout stages, Uruguay faced Cristiano Ronaldo's Portugal in Sochi for a place in the quarter-finals. In the final third of the game, Uruguay were desperately protecting a 2-1 lead, and the ball broke in the middle of the pitch among a scrum of players. A Portuguese player went to scoop it into space with his foot when Torreira—who was off-balance—threw his head at the player's foot in a last-ditch effort to reclaim the ball. He looked like a ravenous dog. The 22-year-old had only just muscled his way into Uruguay's starting XI, having not played in any of the team's qualifying games in South America for the tournament. Torreira put in a heroic shift that night, chopping into Ronaldo with one memorable tackle. "His recycling of the ball is his greatest strength," says Ignacio Chans, a journalist with the Uruguayan newspaper El Observador. "During that game against Portugal, he hardly let Ronaldo touch the ball. He gave him no space to move." 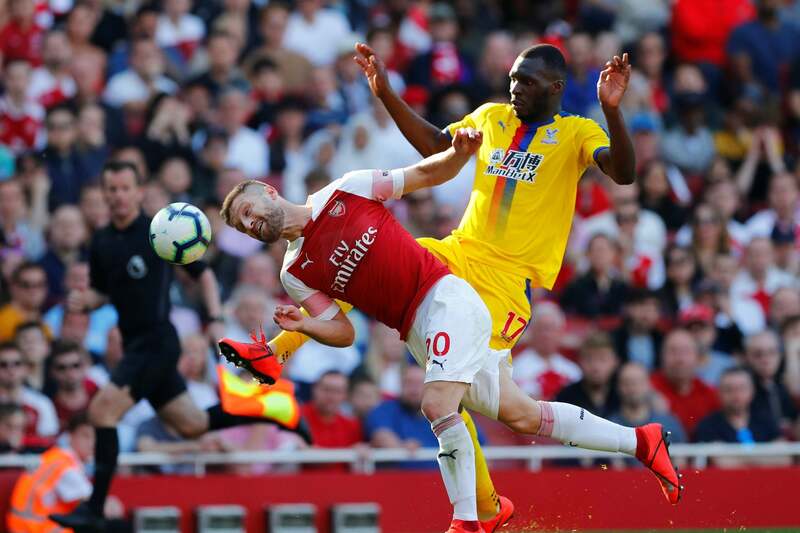 Torreira's tackling—sharp, timely and economical—is one of the reasons Arsenal paid Sampdoria a reported fee of €30 million for him this summer, the biggest outlay the club made on a player in the offseason. He zigzags around the pitch in search of the ball like a man who's busy chopping down trees. "He's quick, aggressive. He snaps into tackles," says Andrew Mangan, founder of the Arseblog website. "He has very natural defensive instincts." Torreira's defining physical feature is his size. He's only 5'6", almost a foot shorter than Arsenal's iconic holding midfielder, Patrick Vieira. With Torreira, however, it's more a case of the size of the fight in the dog than the size of the dog in the fight. Although he's only started a handful of games for Arsenal—as coach Unai Emery has been careful to blood him slowly—he's already establishing a reputation for being a formidable, streetwise competitor. Mangan singles out his performance against Watford, which was only his second start in the Premier League, a 2-0 win at the Emirates Stadium. He took several knocks in the game—and also picked up a yellow card, as he did in his first full league game against Everton—but didn't react. There was no sign of petulance. Neither did a physically big Watford side outmuscle him. "There was a moment in the Watford game where Troy Deeney had been booked," says Mangan. "Torreira was clearing the ball. It was one of those incidents where a player runs across another player as he's clearing the ball and the other player kicks the guy who's run across him. You can discuss whether it's a foul or not. But Torreira made sure the referee saw that Deeney had run across him. It was a little bit of that South American guile or bastardry." Daniel Rosa, a sports editor with El Pais in Uruguay, adds that Torreira isn't a dirty player. During two seasons he spent as a regular starter with Sampdoria in Serie A's midfield battlegrounds, he never got sent off. "Yes—he commits tactical mistakes and he's hard, but he doesn't commit many fouls," says Rosa. "He's not a 'golpeador,' a slugger. He's very technical. He thrives because of his intelligence. He is good at passing the ball and at discovering and occupying spaces. "He's very mobile. He has a particular ability to close down space. He runs smartly—he doesn't have to run much. He gets the job done, covering the backs of his team-mates. It's his greatest attribute. He hardly ever loses the ball. If an opposition team player has a head start on him, he can hunt him down—even if it comes to tackling the ball with his head!" Both Chans and Rosa stress that he wasn't a youth prodigy. He never played representative under-age football for Uruguay. Neither did he play professional football in Uruguay. All the current greats in Uruguay's national team—including Atletico Madrid's central defensive pair of Diego Godin and Jose Gimenez, as well as Edinson Cavani and Luis Suarez—all played in the country's premier division before making the jump to the riches on offer in Europe's top leagues. When Torreira started making an impression with Sampdoria, football fans in Uruguay were caught unawares. "I remember the moment people suddenly started talking a lot about him here in Uruguay," says Rosa. "We heard about this Uruguayan guy who was playing well in Sampdoria. His name was on everybody's lips: 'Have you seen this kid Lucas Torreira?' The thing that struck people was his size. How is a player who is so short excelling in Italy, in a football league that's so physical?" There's a bit of the Napoleon complex about Torreira. He had to work harder than most to make it as a professional footballer. He left his hometown Fray Bentos, a tiny city on the border with Argentina known for its meatpacking and refrigeration industry, at 16 to try his fortunes with the country's premier division clubs in Montevideo. It was a path trodden by his father, Ricardo, and Lucas' talented older brother, Claudio, before him. Both of them failed to make the grade and returned to Fray Bentos. His father's abiding memory of his stint in Montevideo—where he had trials with Miramar Misiones—was the hunger he felt. He juggled two jobs in the city, one of which started at 5 a.m. selling El Pais newspapers. Lucas joined Wanderers youth academy in Montevideo and lived with his sister. He caught a break in December 2013 when a consortium of Italian businessmen brought four Uruguayan boys from the club for trials with Pescara, a team in Italy's Serie B. Torreira was added as the fifth player at the last minute. He was the only one of the quintet invited back to Italy for a second series of trials in January. They liked what they saw and the club signed him. Initially, he didn't play much. The coaching staff thought he might have a niggling foot injury so he was sent for a checkup. It was discovered that he had several warts on one of his feet. He had been playing through the pain without mentioning it to anyone. "He couldn't even walk," said Roberto Druda, the Pescara scout who signed him. "He played on for months and months." Torreira was promoted to the club's first team for the 2014-2015 season. He made his debut in May 2015 against Varese, but the team missed out in a promotion play-off to Bologna. Although he had finally made it as a professional footballer, Torreira had been scrimping by all season, living hand to mouth. Once he turned 18 in February 2014, he could no longer live in the club's youth academy housing. His monthly wage was €1,250, and of that, he had to spend €800 of it to pay for the monthly rent on an apartment he shared with his father, who was in Italy chaperoning him. They largely survived eating out at a kebab house across the street, where they could get kebabs for €1.50. Things picked up the following season when Sampdoria signed him—his monthly salary shooting up to €10,000—although the club sent him back out on loan at Pescara for another season. It was the season afterwards, 2016-2017, in which he broke into Sampdoria's first team. He was on his way. His arrival at Arsenal has generated a lot of excitement because he could plug a gap that's been missing at the club since Vieira's departure well over a decade ago. "He's a defensively minded midfield player," says Mangan. "He's not just somebody who takes the ball and lays it off five yards sideways. His passing is quite good and progressive. His reading of the game is excellent. He makes a lot of interceptions. He cuts out danger before it becomes dangerous. It's something that Arsenal have been missing from their midfield. "Unai Emery and [his coaching staff at Arsenal] appear to be very into the idea of Granit Xhaka. He's a player who has a lot of qualities but also a player with some flaws as well. Torreira—at this early point—looks like the kind of guy who could get the best out of Xhaka so you don't have Xhaka covering back and making tackles. "The fact that the Vieira song has been co-opted for Torreira will tell you the kind of esteem that he's held in by Arsenal fans. I can't begin to explain how long people have been waiting for a real defensive midfielder to come into the club." It's early days, but it looks like Torreira could have the head for the job.